When you start thinking of horses and horse ownership, lots of images start playing in your mind’s eye. At first, most of them probably are the romantic cuts, drawn mainly from watching The Man from Snowy River and Open Range too many times. As you get closer to making that decision to actually buy a horse, those images might start to include scenes of the more practical sort like feeding and training (and if you’re the Dad, you have visions of your wallet being wrung like an old dishrag). But still your mind’s eye is adulterated by the filmmaking industry, which even when they do cover “difficult” or “headstrong” horses, the problems are overcome easily in the course of a two hour feature film. I apologize if I am the first to break this news, but Secretariat, Black Beauty and National Velvet are works of fiction. Trailering is simple. So is astrophysics. There’s a reason that even those movies that touch on horse training never show real people getting real horses into a trailer. That reason is that every actor has a clause in his or her contract with injunctions against the actor being made to look like an incompetent fool and against smaller injustices, such as being kicked to death or squashed between a steel wall and one thousand pounds of horse. On the outset, it really doesn’t seem to be too complicated. The horse seems to trust you. You feed, water, groom him, and clean up his poop. In return, he lets you ride him and seems to follow your commands reasonably well. When you walk him around the arena or lunge him in the round pen, he follows your leads just fine. Surely he’ll follow you out of the pasture and into a trailer. This is simple, right? This leads me to one of my cardinal rules of horses, one that I’ve adapted from two decades of military service. If anyone says “this is simple,” it’s time to take cover. Let’s look at this from the horse’s perspective. You are a herd animal. You like to be with other animals, particularly with other horses. You crave stability, firm ground, and readily available forage, and new things tend to make you nervous. You are created to live and thrive in open country where you can detect predators at a distance and use your speed to elude them. And now this human, obviously off his rocker (he collects poop for heaven’s sake! ), wants to lead you alone into a dark metal box that moves when you step in it. You outweigh him by half a ton. 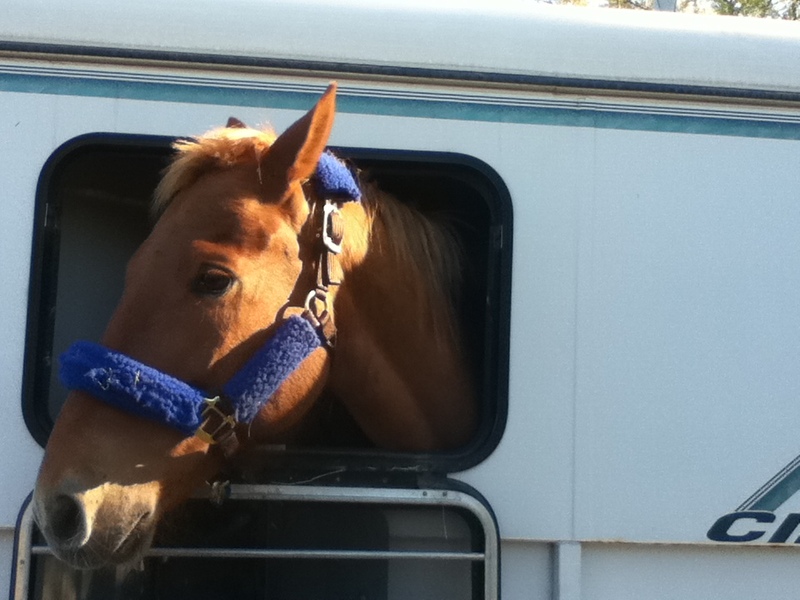 Trailering, it turns out, is one of the most difficult things with some horses. Like so many things with horses, we find out we are hoodwinked on this fact. After signing the contracts on our two horses, Jasper balks a bit at getting into the trailer, but his previous owner gets him in with a bit of urging. “He’s a bit trailer shy,” she says. Zip, on the other hand, walks in with no questions, just a point of the finger. We have no idea that: 1) Zip is the product of years of training combined with his overly-compliant personality and 2) One should view the words “a bit..” attached to any possible vice by a person trying to sell a horse as a bright red warning flag. After a short trip to the vet for a health check and tests, Rachel our horse trainer gets Zip and Jasper back into the trailer with “a bit” of effort, and we make the two hour drive back to the barn near our house where we will board them for the next few months. After unloading them into a paddock and feeding and watering them, we head home. The next morning, we arrive to work with the horses, and Rachel suggests we start with a trailering lesson for Jasper. We’re excited, because Rachel is the type of horse trainer who can get horses to do just about anything. In fact, when we were looking at horses to buy, one of the owners took his horse off the market after seeing Rachel work with him, and in one session getting the mare to do several things he had told us she flat out was incapable of. Rachel demonstrates, lunging him around and back and forth in front of the trailer for quite a while, working him into a sweat before walking him towards the trailer. He wants nothing of it, so she brings him out and works him some more… and some more… and some more. After about an hour, he walks in tentatively, then comes right out. Rachel declares victory and tells us that we need to do this every day until he gets right in. “It might take a week or so before that happens,” she says. Oh, but I’m still so envious. My daughter and I would love to have horses. Enjoy them (even though it’s hard work). Thanks for stopping by, Eliza, to support a fellow backspacer! That gives me a great chance to plug Backspace – for all you writers out there, there is no better community out there for learning, networking, and support!